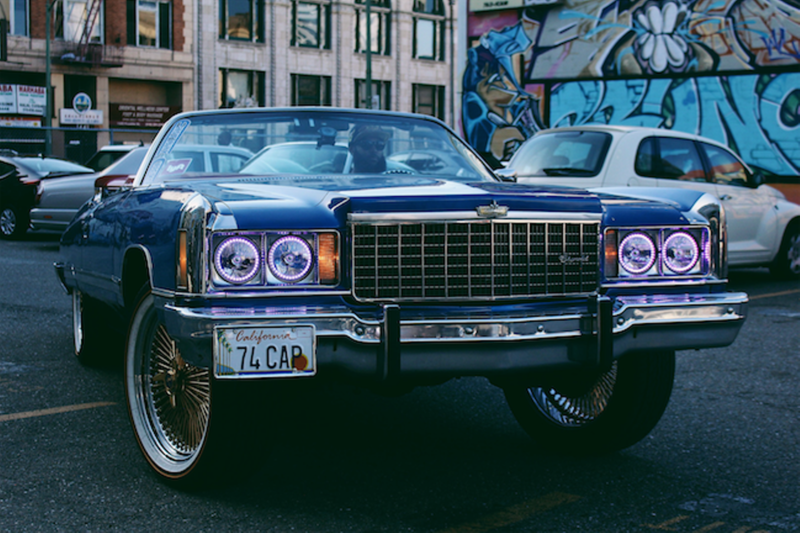 DropReg, president of the East Bay Chevs group, in his ride during a video shoot in downtown Oakland. RESPECT: Hip-Hop Style & Wisdom, the major spring exhibition at Oakland Museum of California opening on Saturday, promises to reveal the secret history of hip-hop culture’s emergence from the tumult of the 1970s as a dynamic social movement with profound, far-ranging effects on contemporary life. The exhibition, informed by more than 50 hip-hop historians and practitioners, unfolds across six thematic sections, with special attention to the culture’s beginnings and the pivotal role of Oakland and California. Original artifacts sourced from private and university collections display alongside more recent work by local artists such as Brittani “Brittsense” Sensabaugh, known for conveying the nuanced dignity and resilience of disinvested Black neighborhoods through her bravura photography. In typically interactive OMCA style, RESPECT also features a “Hip-Hop Dojo,” where an ace slate of artists and experts will lead workshops, classes, and demonstrations throughout the span of the exhibition.